I started by stamping the chocolate drop candy (Repeat Impressions) in Milk Chocolate chalk ink (QuickQuotes). I colored it with a Copic marker & masked it with removable paper. 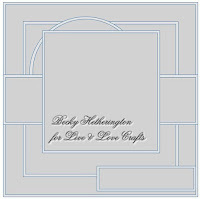 The sentiment & chevron stencil are from a Recollections set. I colored the stencil with Copics. 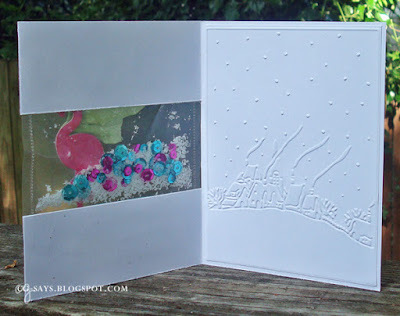 I used a Hero Arts block stamp & Memento Desert Sand ink for the cracker-y rectangle. 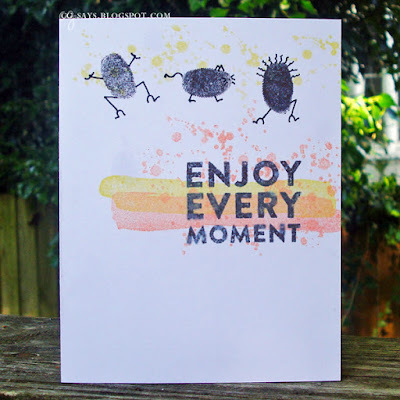 The marshmallow splat was created with a TH stencil & Tsukineko Amplify ink. Love how this ink textures when heated. 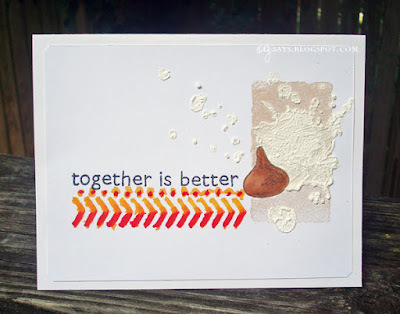 The chocolate drop candy stamp is from Repeat Impressions. The silver ones were heat-embossed on scrap tinfoil; I used Milk Chocolate chalk ink from QuickQuotes to stamp the 3rd candy on white cardstock & colored it with a Copic marker. I had so much fun making my coffee-hued card for the Summer Coffee Loving Cardmakers Link-up that I decided to make another with brighter colors. 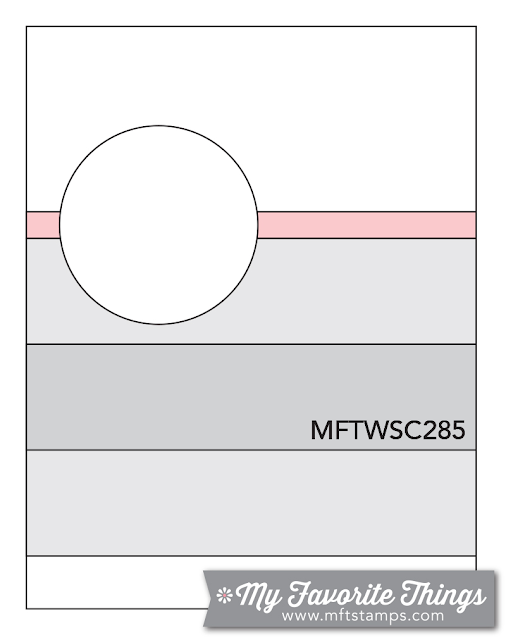 I made a notch swing card to make the most of the front-and-back stamp. I created the shaker with my WRMK Fuse tool & Fusaeable paper, and filled both sides with sequins & microbeads. The cat is inspired by Creamer, a stray in our neighborhood who was adopted by Marian House II across the street & now has gone home with one of the residents. I sure do miss that cat, it always let me pet it. Twofers Challenge #22: Tea, Coffee or Me? Happy Summer! 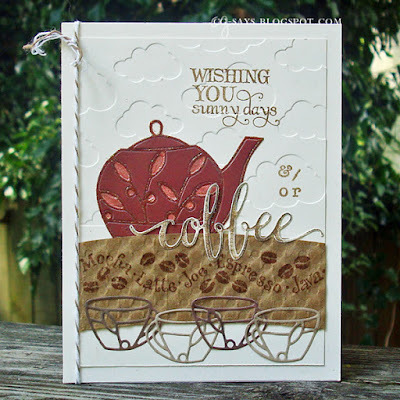 A new season means a new Blog Hop & Link-up with the Coffee Loving Cardmakers and I always enjoy playing along & seeing all the gorgeous projects folks come up with. I admit to having a pretty severe coffee-in-the-morning habit. And in the afternoon. And possibly the evening...! 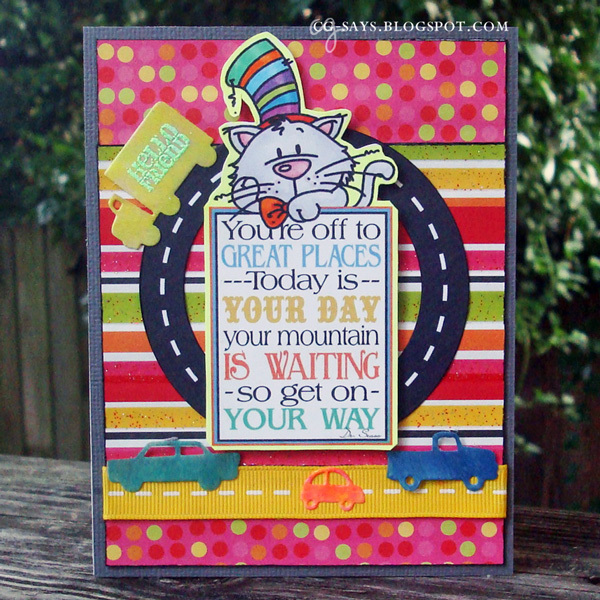 I used a Verve Stamps sentiment, character stamps from my stash, and an YNS die to make this hopefully humorous message. I stamped with QQ chalk ink directly onto a white cardstock embossed with a TE folder. I sponged the same ink onto the white "coffee" die cut. I used distress ink to stamp the coffee-themed rubber stamp onto a coffee cup sleeve. 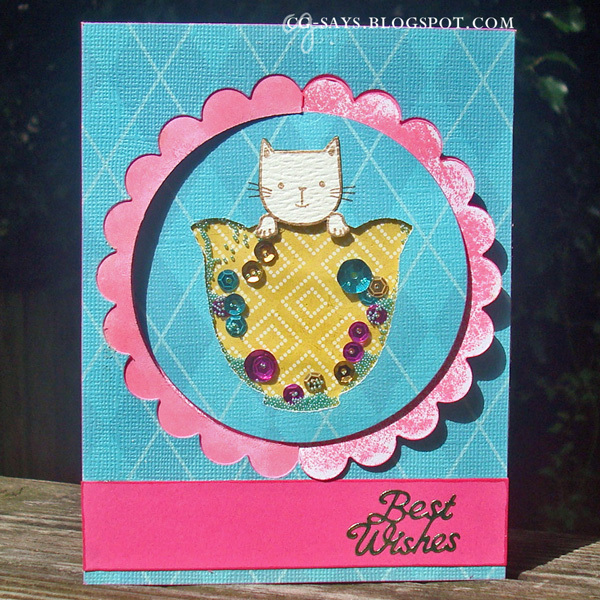 The teapot & cups (Elizabeth Craft Designs) were backed with an adhesive sheet before cutting, to make them easier to adhere, and die-cut in my BigShot. All of the papers, except for the card base & coffee cup sleeve, are from a CTMH collection. They were just perfect! The delicate cups were cut from one double-sided paper. I finished the card with a bit of baker's twine. I used a city stamp from Mark's Finest Papers, page protector pieces, my Fuse tool & a Fuse paper to create the shaker portion. I filled the city & border shakers with blue MS microbeads & confetti from Recollections. I cut up a piece of watercolor cardstock to create all the panels. I only used 3 inks: QuickQuotes Coral, Memento Sprout, and Hampton Art Royal Blue. I cut a mask with a circle die to create the sun element. 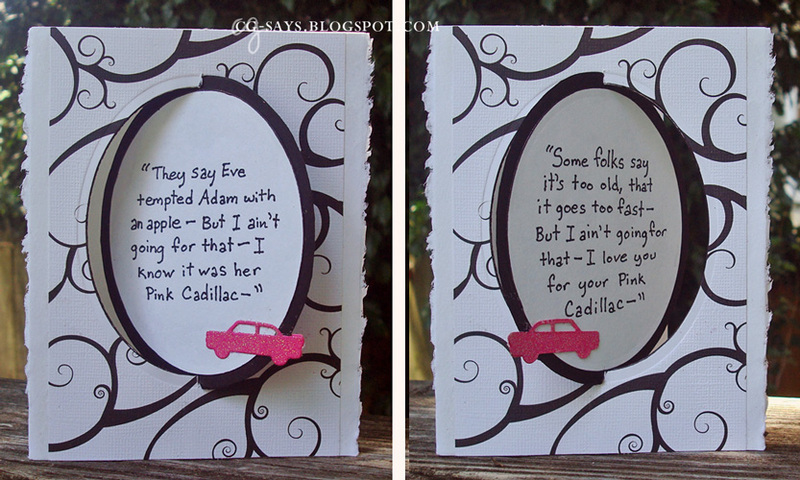 Ever since I received the "Transportation Little Bits" die set from Taylored Expressions, I wanted to make a "Pink Cadillac"-inspired notch swing card using oval dies. I'm quite proud of the classically lovely yet naughty result! 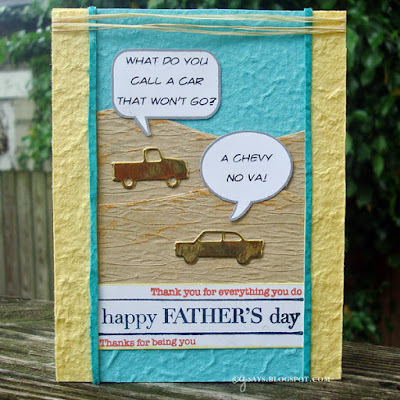 I wanted to make something extra-special for my Dad for Father's Day, so I was inspired by a silly joke he used to tell. The cars are cut from a gold cardstock using Taylored Expressions dies, the word bubble stamps are from a Latina Crafter set, the sentiment stamps are from SP Stamps & Fiskars, and I made the sentiments myself using the CrimefightBB font. I used Memento & QuickQuotes inks. The papers are all handmade/textured papers from my stash. 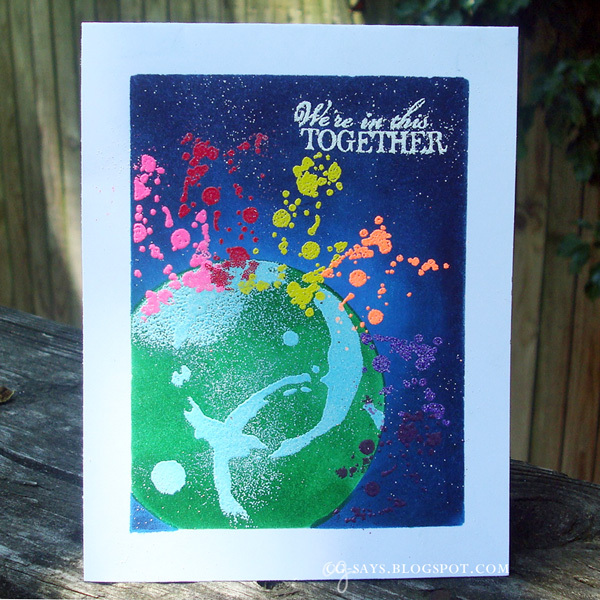 I've grown to truly enjoy the challenge of one layer cards, so when my husband gave me the craft prompt of "the Whole World in Your Hands," I was reminded of the fun I had with the Less is More "Splatters" challenge & created this hopeful card with a color combo directly inspired by the original Gay Pride Flag. 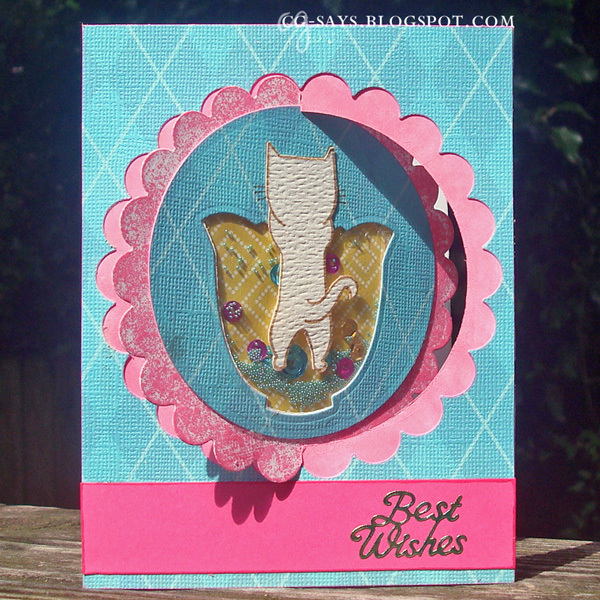 I started by making a frame mask for the outer border from scrap cardstock; I did the same for the circle piece. 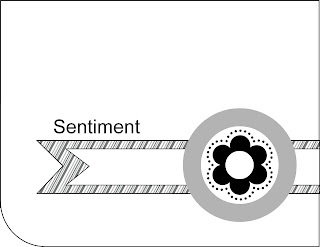 I used both the circle & its negative to mask the sections of the center image. 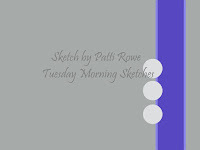 I used bright Blue ink & dark Navy inks to create the background, . I used Pine Green pigment ink & blue embossing powder for the Earth element. I used a coffee-stain TH stencil to create the ocean. 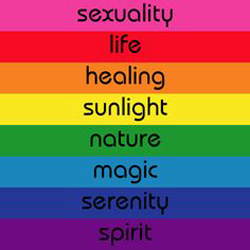 The rainbow rays are stamped with watermark ink & heat-embossed it the beautiful colors in my stash. The sentiment is from Verve Stamps & is heat-embossed in a glittery white powder; I purposefully let some of the powder remain on the background. 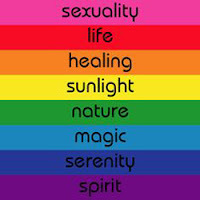 This is a keeper, like equal rights! I had so much fun making & using my nut stamps that I decided to use them again to make a CAS card featuring a "nuts & bolts" pun. The bolts are high-quality PNGs that I grabbed for free at Clker. The sentiment is from a Recollections set. Update: This was a Top Pick at Stamplorations! 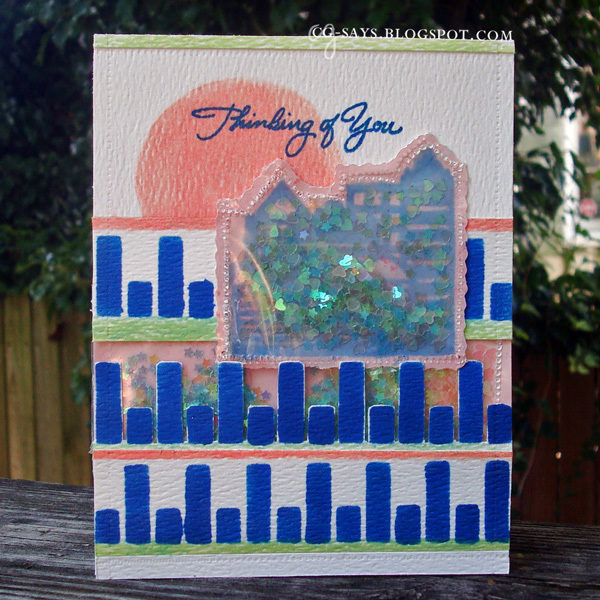 Our late-Spring weather has been lovely, but the humidity is slowing creeping up along with the temperature, so I decided to make a "cool" card. 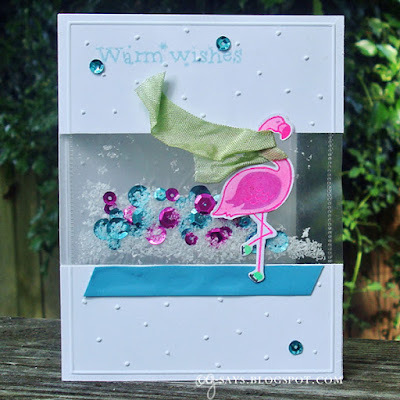 The flamingo is from a Recollections stamp/die set. I cut the legs separately in order to turn them around to make it look like the flamingo is ice skating. I hand-drew the legs & tiny skates. 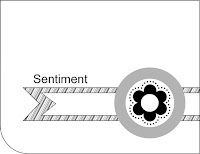 The scarf is a piece of seam binding from Paper Sweeties. The scenic embossing folder is one of my favorites; I got it for a steal at a yard sale. I used the top portion for the front flaps. I used a page protector & my Fuse tool to create the shaker portion. The blue & pink sequins came with a Fuse kit & I added some snowy Flowersoft. 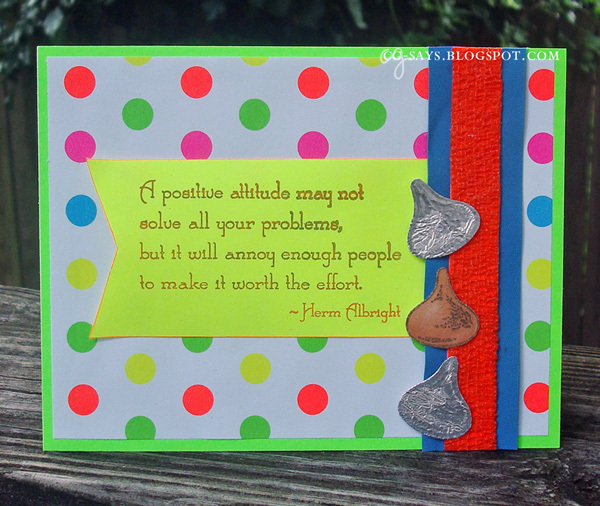 The sentiment (Marianne Designs) was stamped in Tumbled Glass distress ink. I added three sequins with Glossy Accents. The "lake" is made with a blue rubber tourniquet. Update: This made the Top 5 for 613 Avenue Create #180! 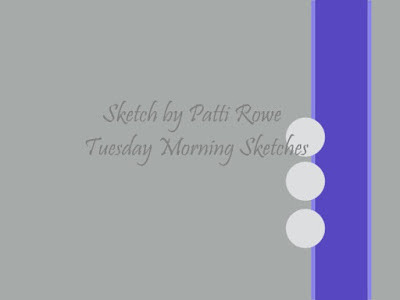 It's one layer week at Less is More; Clean & Simple stamping is such a skill, and I feel more confident with every try. That being said, clean & crisp isn't really my style so I like to get a bit artsy with it! Here's a Father's Day card I made for my Brother-in-law. I used 3 inks: Memento Tuxedo Black, SU! 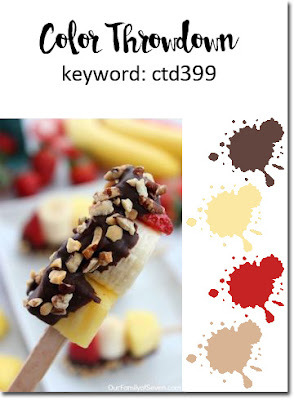 Barely Banana, and QuickQuotes Coral. The splatter, smudge, and sentiment stamps are from a Recollections "Color Splash" set. I spritzed the stamps to create a messy effect. I used my index finger to stamp the prints, and doodled on them with a fine black pen. Super easy & fun to make! 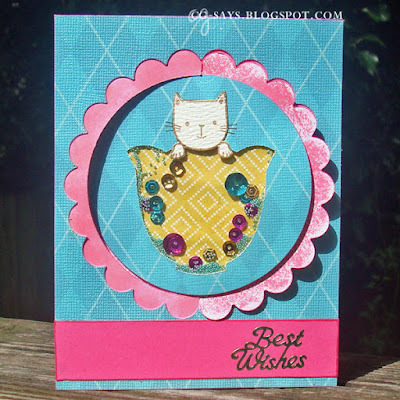 The theme this fortnight at Pile It On is Something Old, Something New, Something Blue. 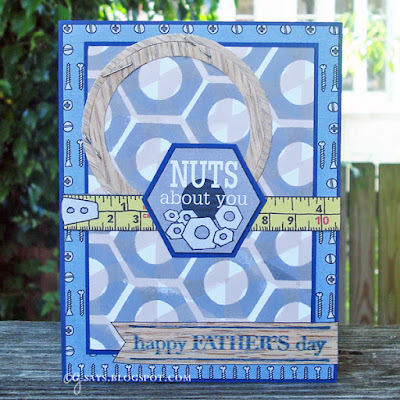 We're sponsored by Eureka Stamps, but this time I made a Father's Day card featuring patterned paper & a sentiment piece from the "Handyman Hero" collection that came free with an issue of PaperCraft Inspirations. I made the nut-patterned paper myself. I used a die, a punch, & hand-cutting to make the stamp out of foam. I made two stamps, one for each color.